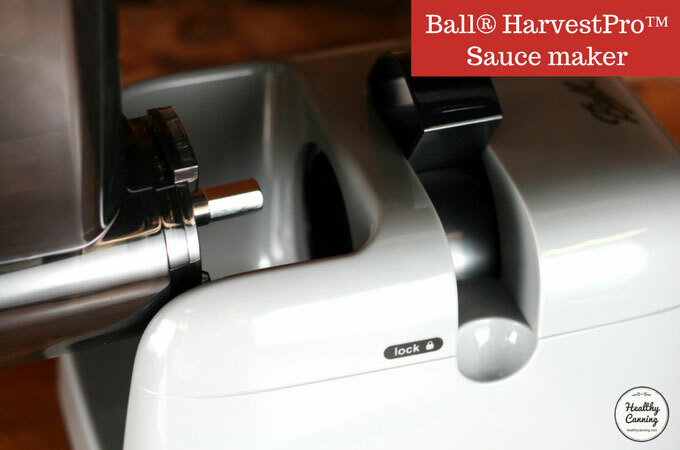 The Ball® HarvestPro™ Sauce Maker is a good mid-range tomato mill product, and very good value for its price point. 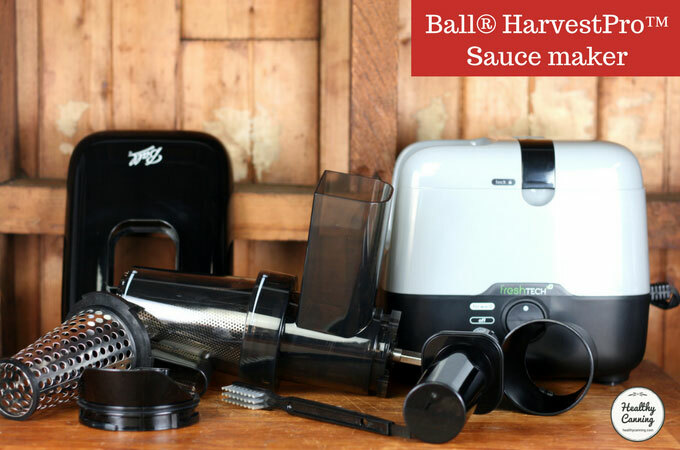 It’s among the least expensive of the electric food mills, but comes with some very desirable features, such as a splash cover, a wide chute, a blade that automatically cleans the grinding screen as it works, and it is very, very quiet. 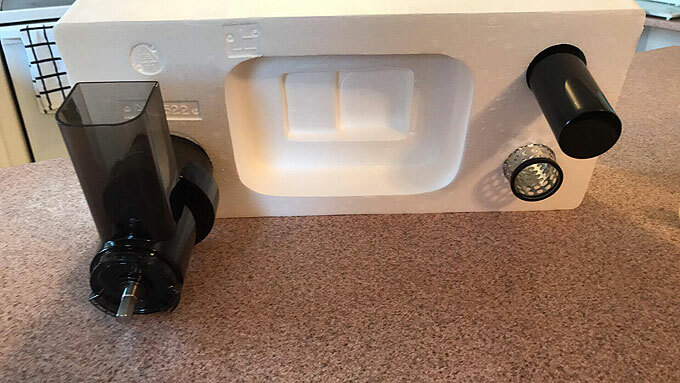 Replacement parts are available, which we believe is a top consideration for buying any appliance — especially one with so many pieces. 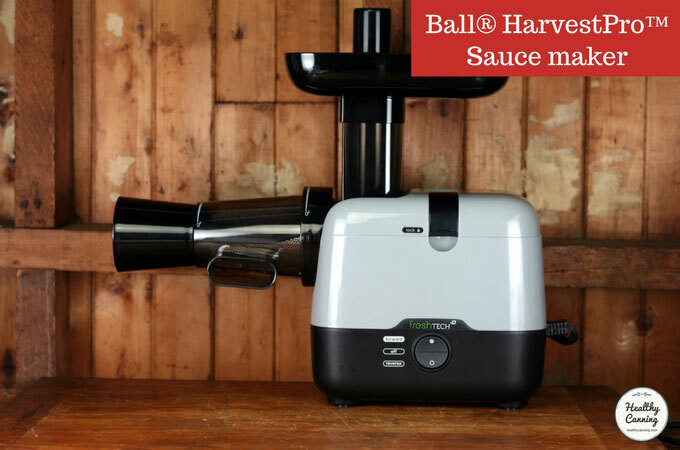 The Ball Sauce Maker has a 150 watt motor and is advertised as being capable of producing 15 litres / quarts of tomato purée in 20 minutes. 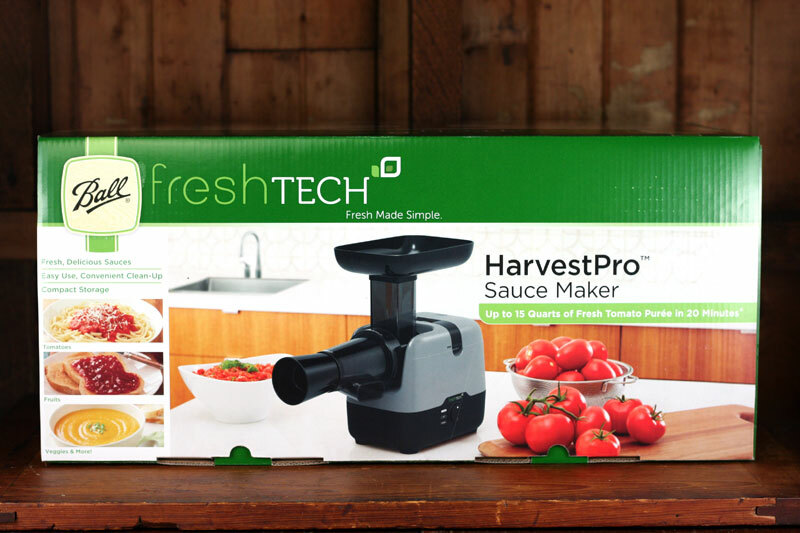 There are far more expensive models of tomato mills available, costing up to hundreds and hundreds of dollars. 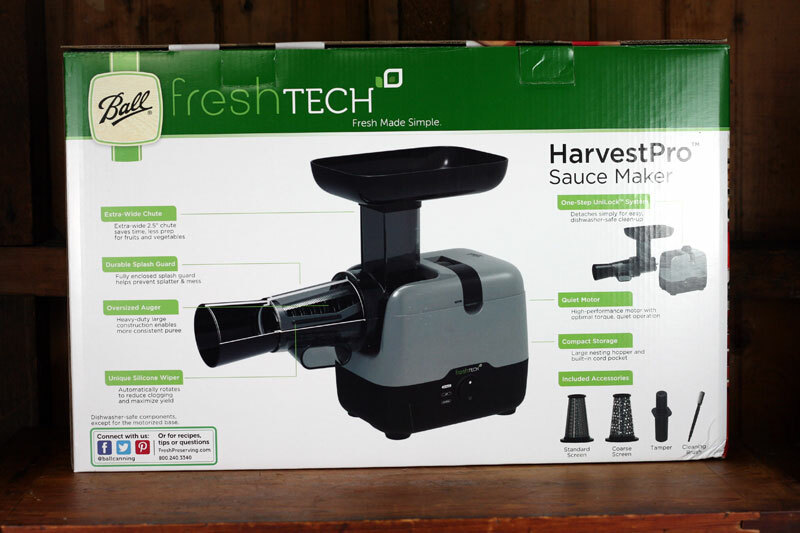 The more expensive models do have more powerful engines and are capable of doing 300 to 600 lbs (135 to 270 kg) of tomatoes per hour, but they have their downsides, too: no splash cover, not auto cleaning blade, and far, far noisier. 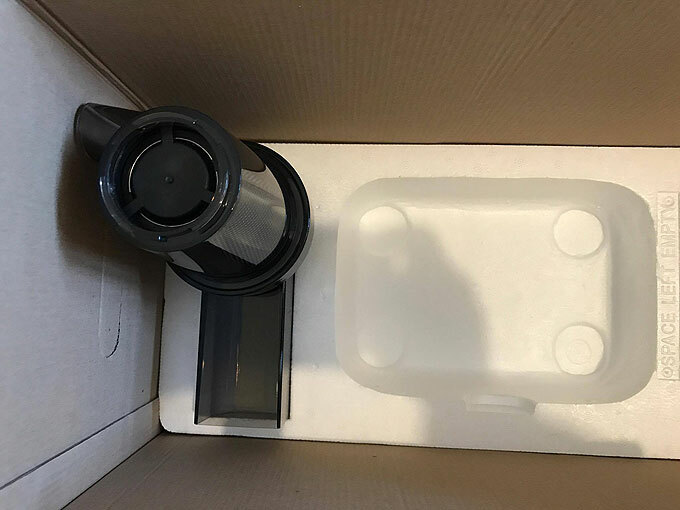 The machine is made in China, but clearly to very high standards. 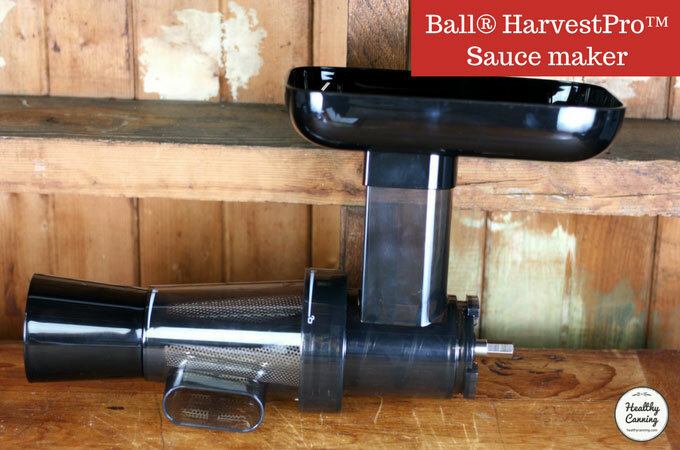 In our first run, with Roma tomatoes, the machine extracted about 7 litres / quarts of juice from 8 kg / 17 lbs of tomatoes. 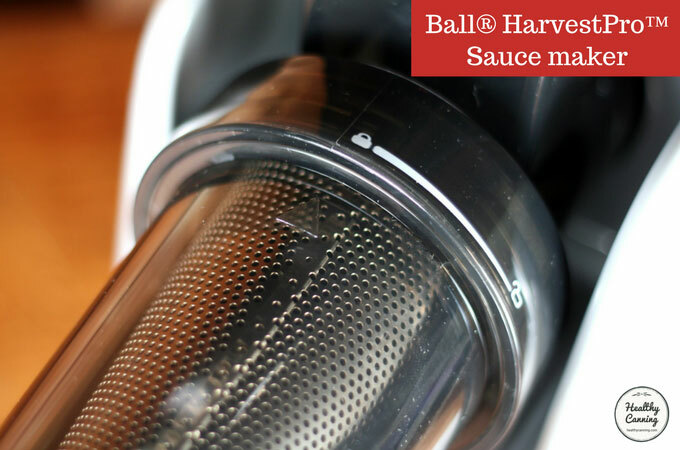 Ball advises that you can do a second pass of the solids through the machine. 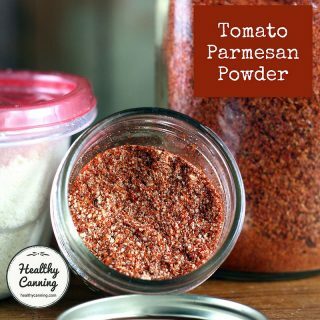 We would add that you probably definitely want to do this, as the second pass can get a significant quantity of some very thick quality tomato sauce out of these solids. 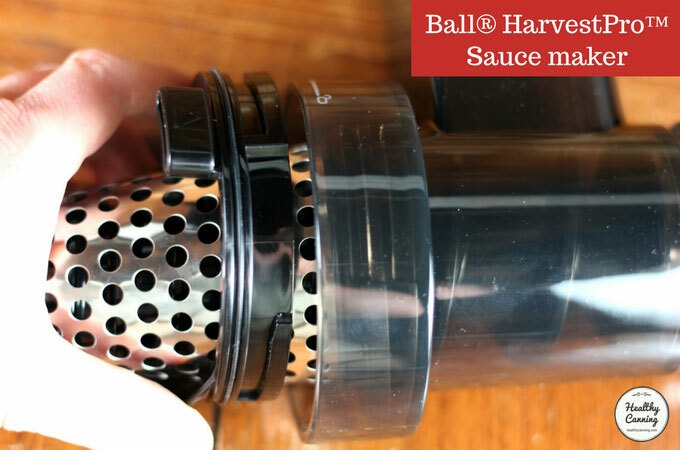 As the solids are drier, though, they can stick a bit: so save a unpressed few tomatoes from the first pass, and use them to help lubricate the second pass. A third pass proved pointless. 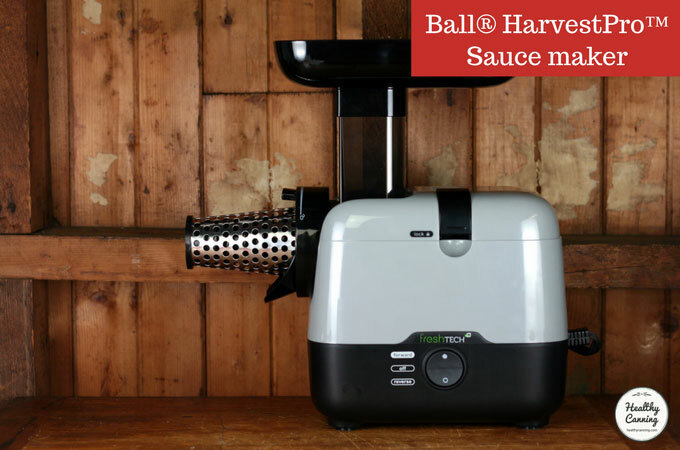 Ball advises that you should heat the tomatoes first before putting them through the machine to get more out of them. “Wash tomatoes, core and cut into quarters. 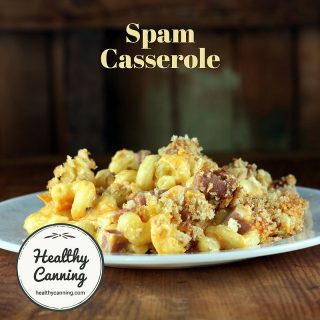 Cook in large stockpot over medium heat until softened. Remove from heat and allow to cool. 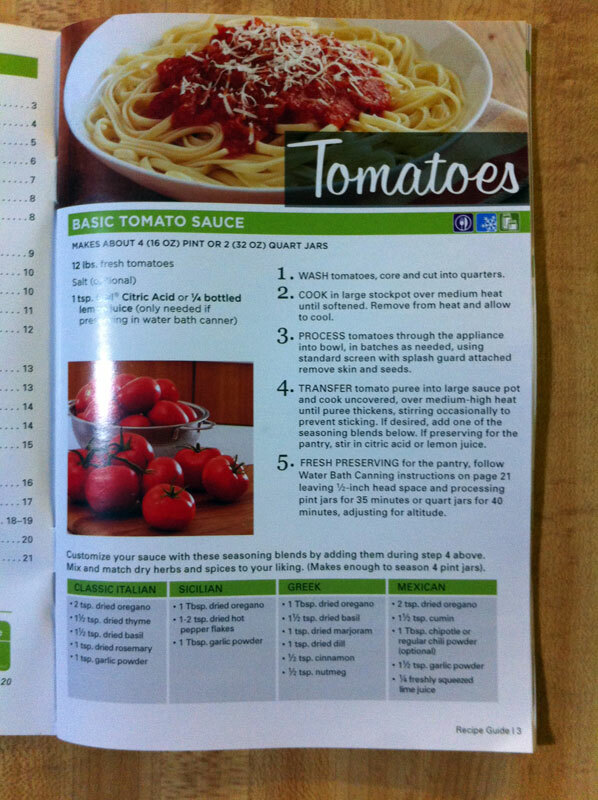 Process tomatoes through the appliance.” Sauce Maker book, 2016. Page 3. 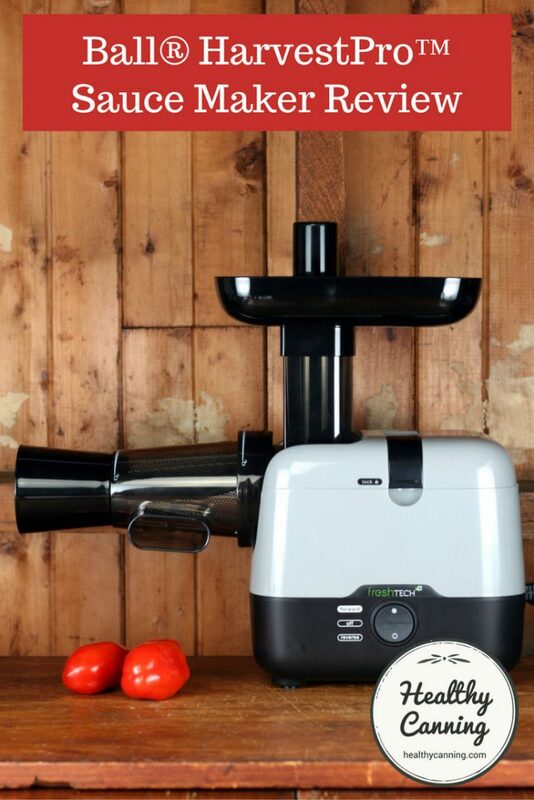 This heating advice may be disappointing to some who thought they were going to skip that whole pot prep stage thanks to this machine. 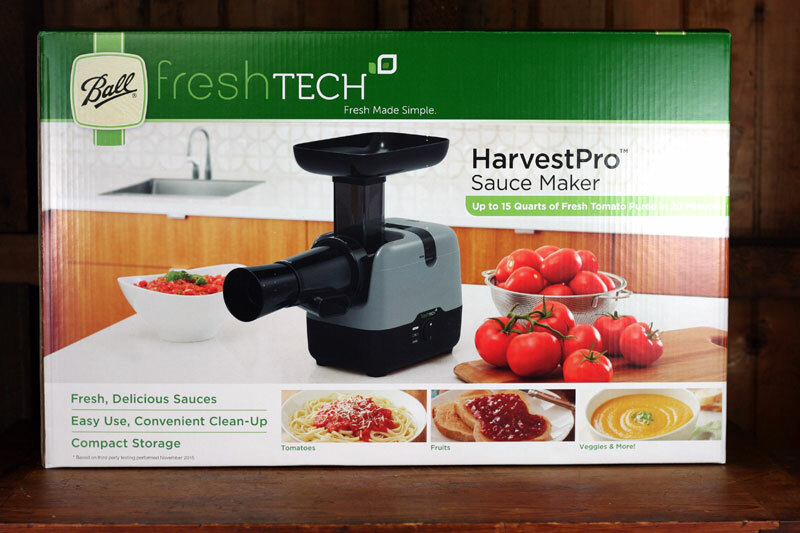 Note though that some reviewers on Amazon have said that they have just put washed, fresh quartered or halved completely raw tomatoes through, and been happy with the output after putting the residue through the machine a second time. The coarse attachment is for salsa. 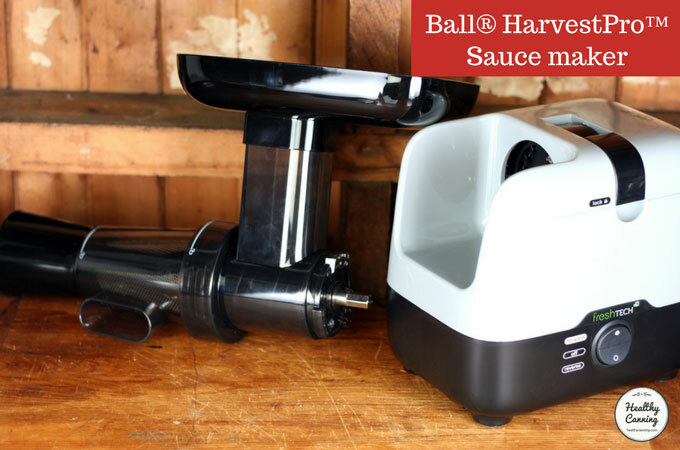 If you really want a chunky salsa, you should stick with using a food processor. 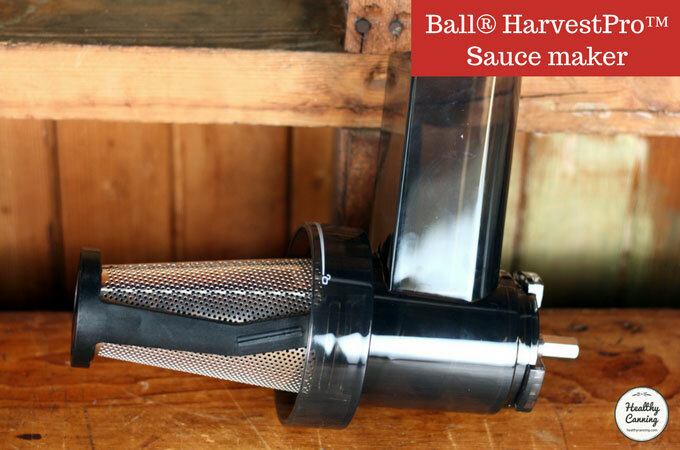 This attachment will produce a “soupier” salsa, more like gazpacho soup texture. We didn’t have luck with muscadine grapes for juice. 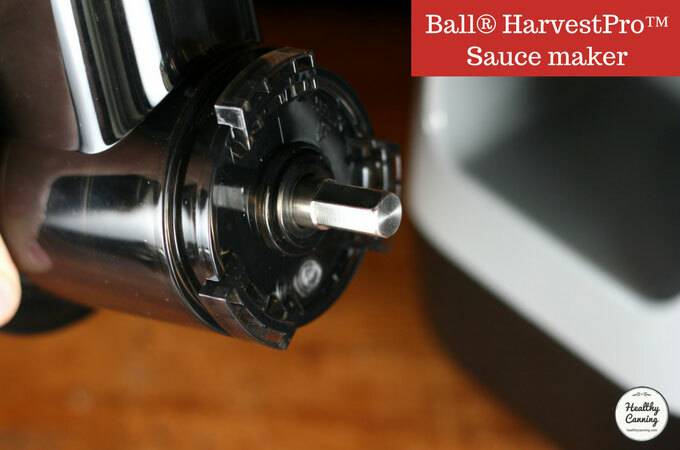 They repeatedly jammed the machine’s sauce assembly. It is unclear if it were all the grape skins causing the jamming, or the seeds: muscadines are known for their very hard seeds. 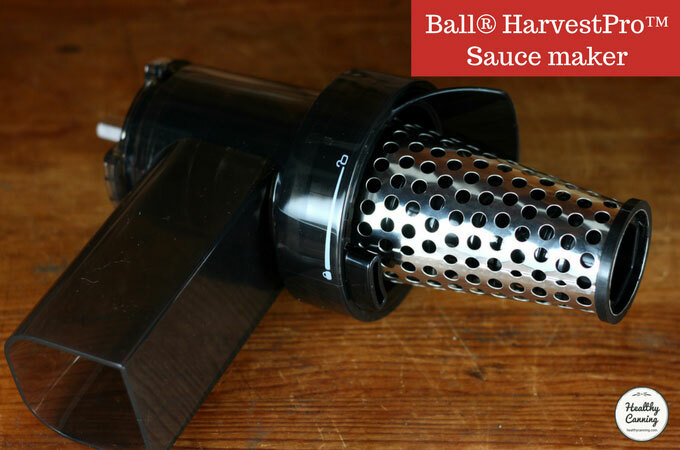 Some other food mills (such as those from Villaware, and Victorio) come with optional “grape spirals” which you can purchase separately, which are meant to prevent such jamming with grape seeds. Perhaps one day Ball will offer one as an accessory, too. Do not put anything frozen through this machine! Make sure it is completely thawed first! 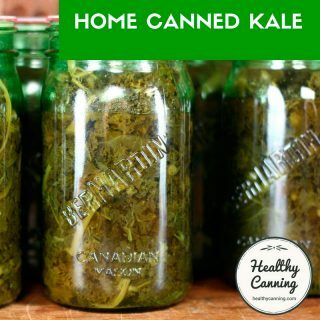 It’s normal during the harvest season to freeze produce until you have time to deal with it for canning. But, do not put anything in a frozen state through this machine. 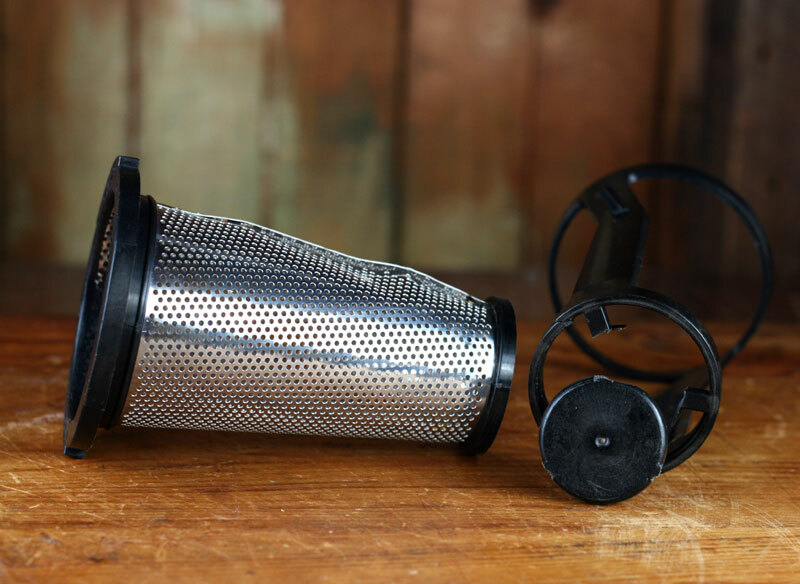 Though the motor seems like it can handle it, the grinding attachments will not. 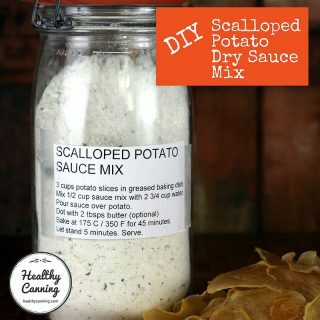 The hardness will cause the pieces to break, even if the produce is partially thawed. Make sure the food stuffs going through are all 100% thawed. 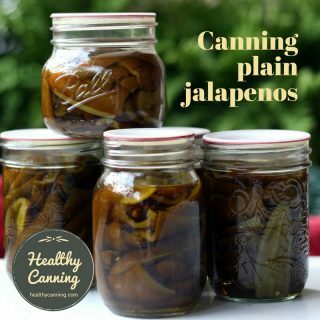 The parts are inexpensive enough to replace, but the time it takes to get them will almost certainly be too long for them to arrive in time for the produce you are currently canning. 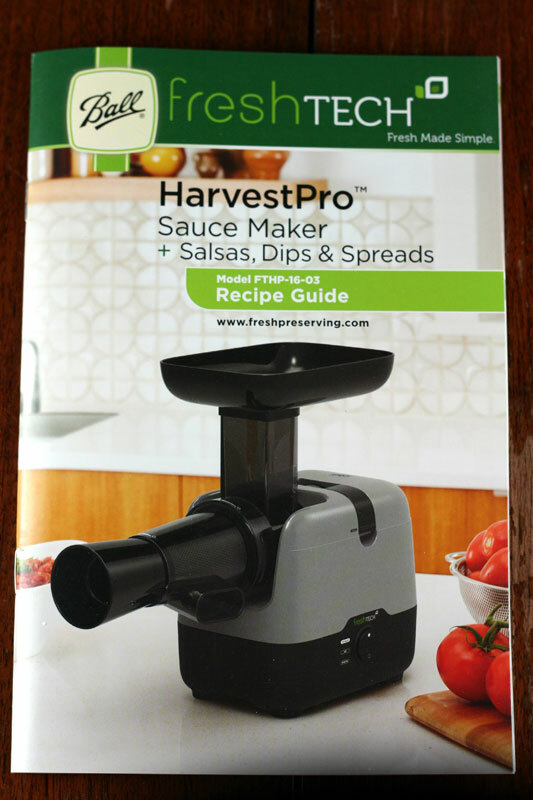 The recipe manual for this machine gives a recipe for Pico de Gallo. 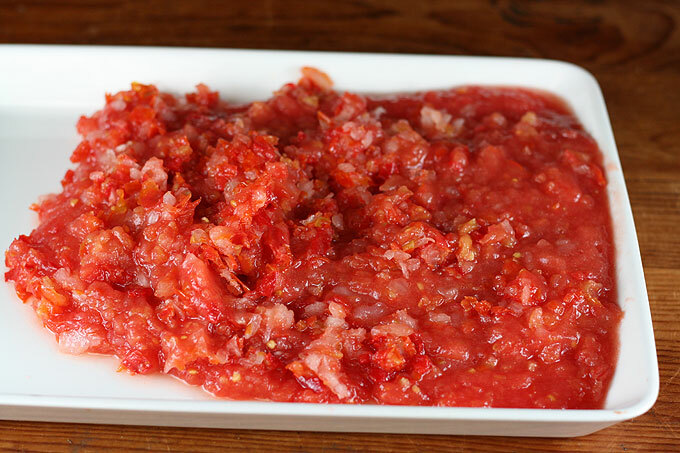 This is a photo of how the combination of the main ingredients — seeded Roma tomato, onion, and pepper, fed through together as directed — came out of the machine. 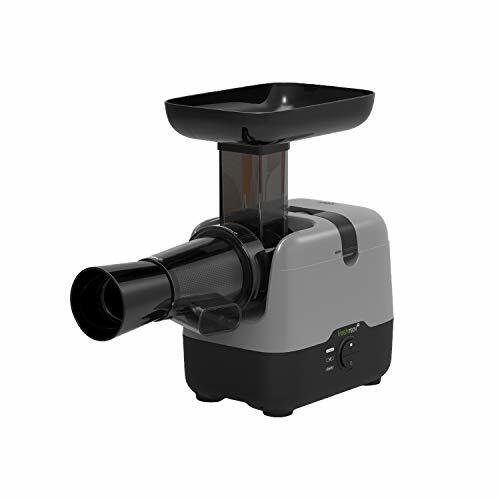 There’s no added lime juice, vinegar or other liquid yet: this is direct from the nozzle of the machine. 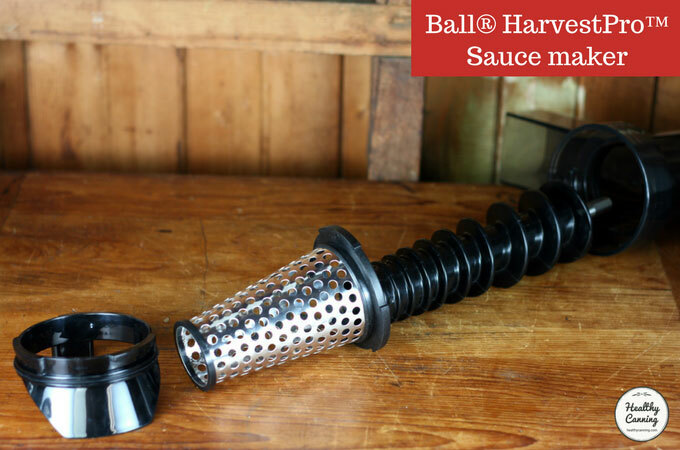 Below is a photo of the sauce attachment in place, ready for action. You need to supply your own bowls. 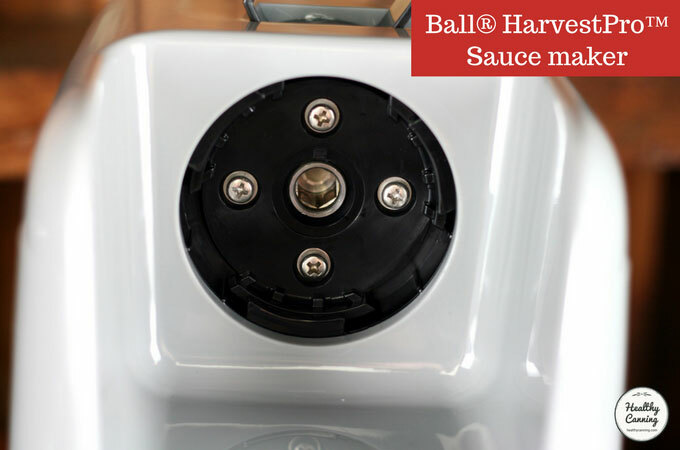 The tall white bowl is in place, ready to catch the sauce that comes out the side. The bowl at the front is ready to catch the residue of skins and seeds that will slowly chug out of the front nozzle. Setup with bowls (supplied by you.) Notice the button on the side of the machine. Press and release the top of the button to make the machine to start. If you need to clear the graters, press the bottom of the button to put the machine into reverse. You have to hold that down; when you release it, reverse will stop. One half of the book is recipes. The first recipe in recipe half of the book. 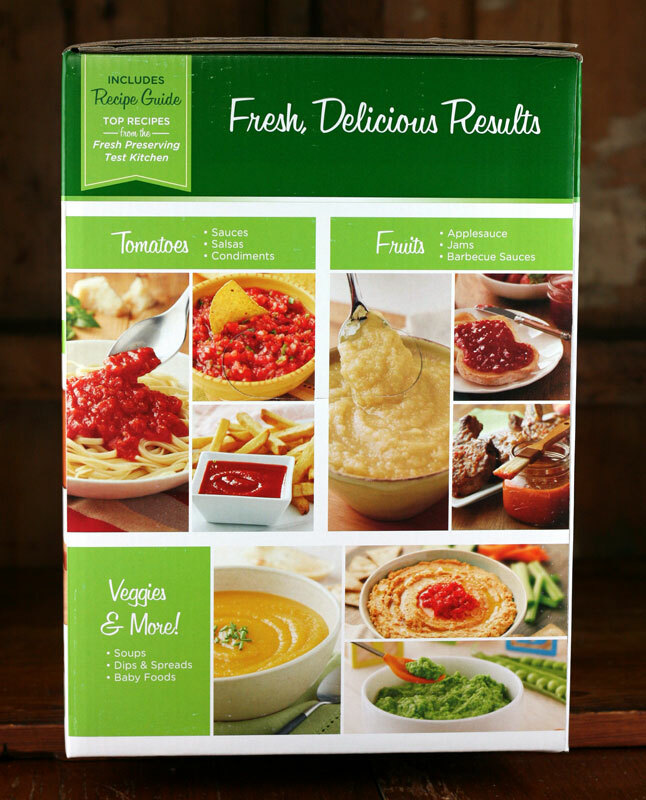 The recipe book that comes with the machine has 15 canning recipes in it, and other non-canning recipes for soups, dip, baby food, etc. 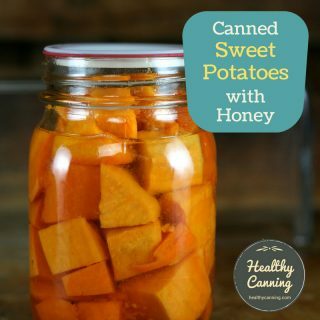 In several of the canning recipes, citrus juices are called for, and it’s not always clear whether fresh or bottled is meant. 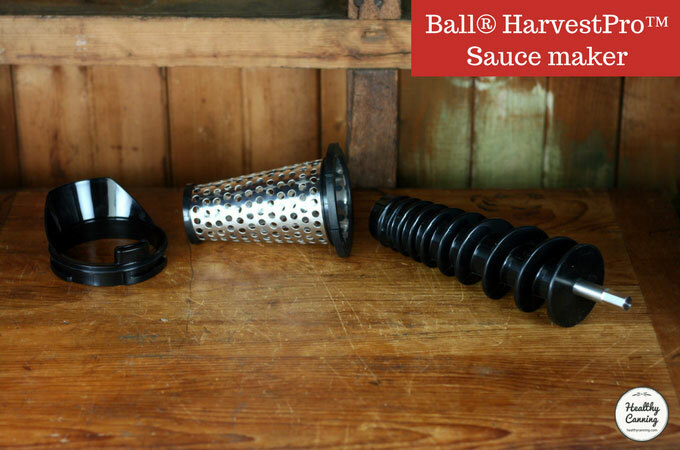 We spoke with Ball, who clarified the issues for us. Mary Jo at Ball. Email on file, 26 September 2016. Jam recipes call for lemon juice” (fresh or bottled is fine). The book does give some weight measurements but there is no metric. 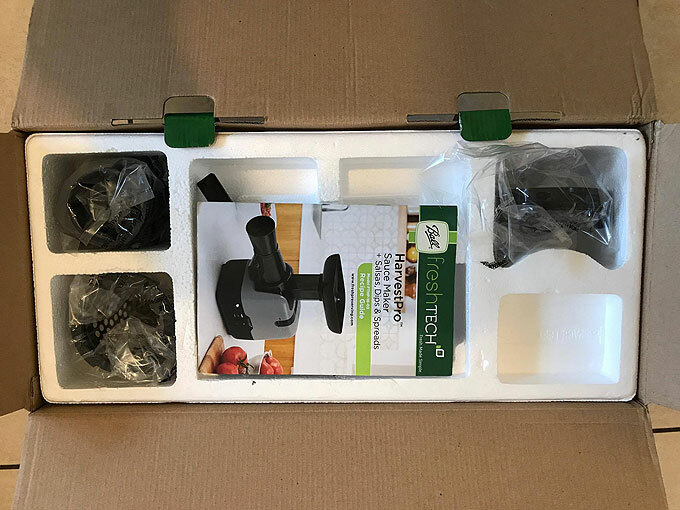 Those purchasing this machine in other countries such as the UK, Australia, New Zealand, South Africa, etc may wish to make sure they have access to North American measuring cups to use the recipes as 1/2 cup lime juice will be called for, without clarifying that that is also 125 ml / 4 oz. 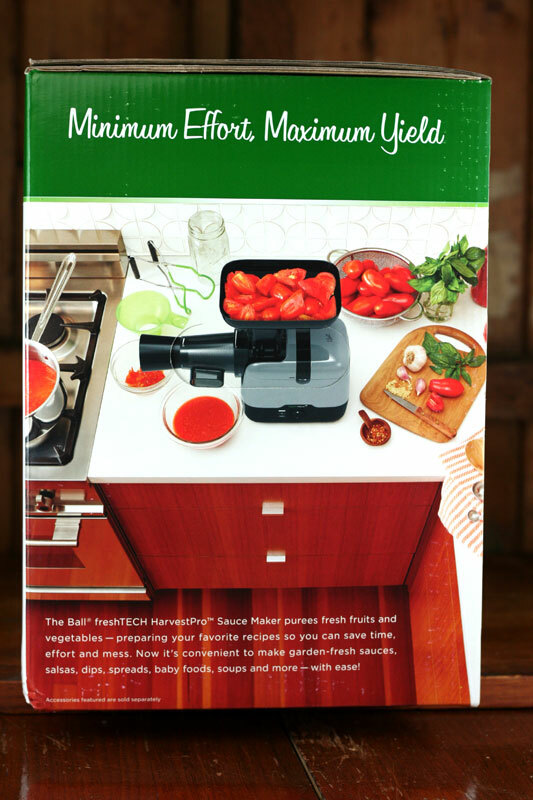 You do NOT need to use this machine only for the recipes in the recipe book. They are supplied just to get you started thinking about how to use the machine. 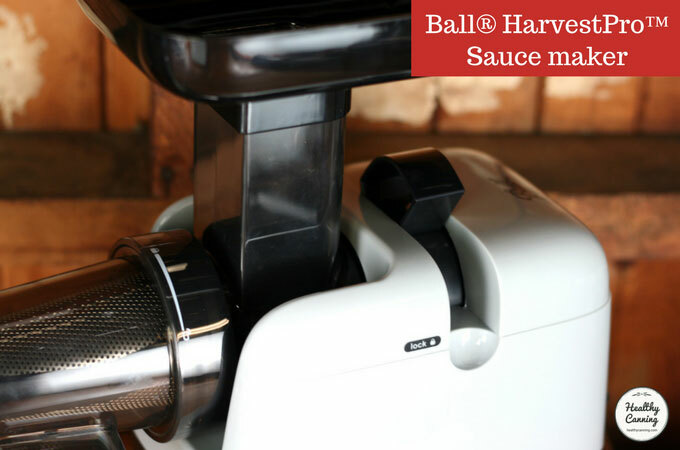 You can use this machine with just about any recipe, canning or non-canning, that calls for food to be passed through a food mill. Here’s all the pieces — though you would never use them all at once. 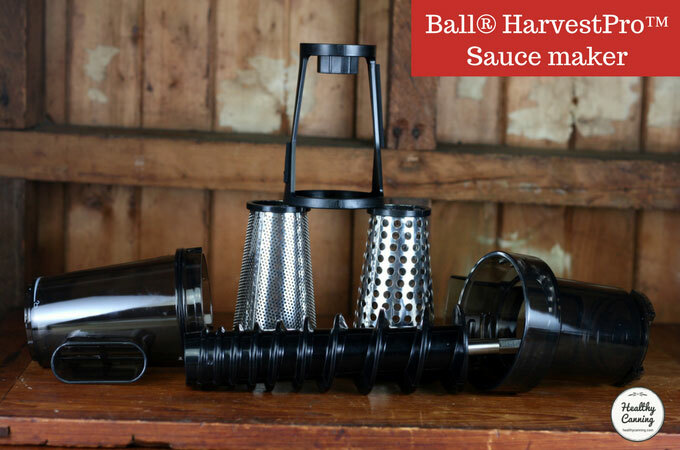 Ball refers to the two metal grating cylinders as the “screens.” Perched on top of them is the blade cleaner that rotates around them during operation to scrape food off them. 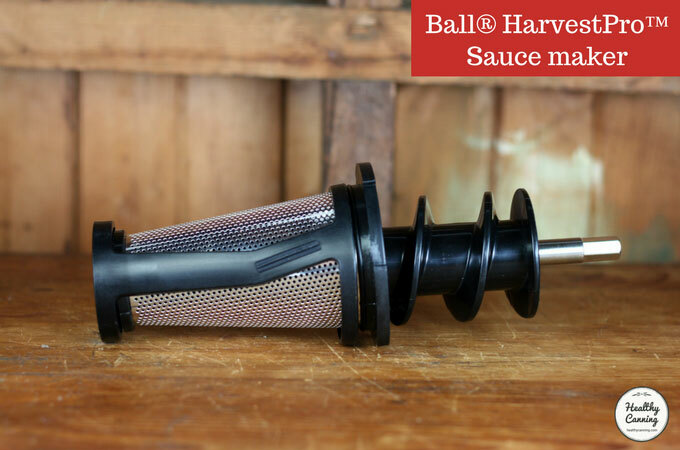 The cleaning brush that comes with the machine. 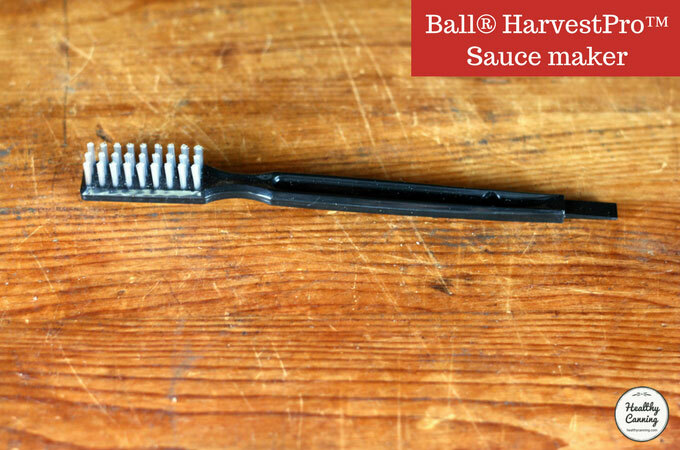 It’s essentially a coarse-bristle toothbrush, with a pick on the end of the handle. We found that a bog-standard washing-up brush did a better job than this, but not all households may have such a brush for dishes. 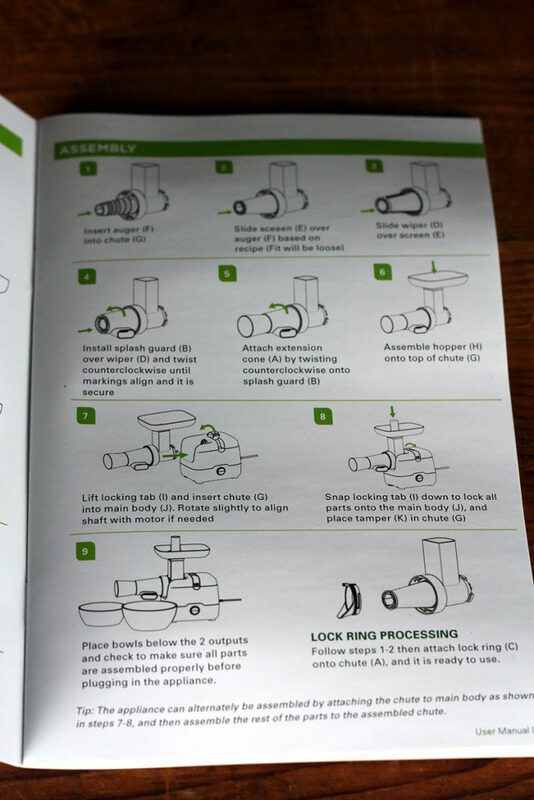 There are two different ways to assemble the nozzle. 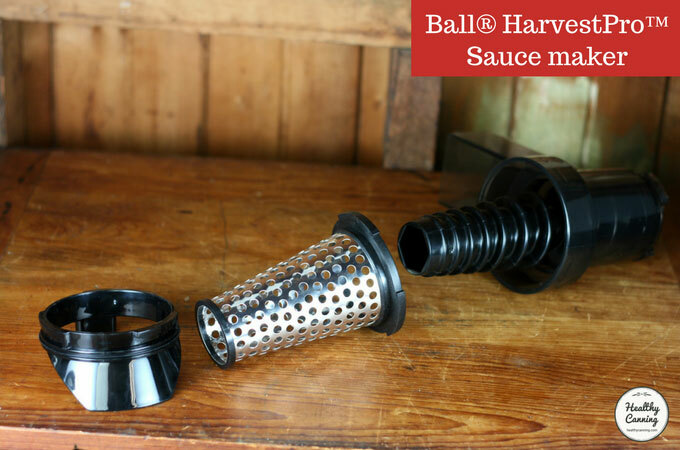 One is for sauce (“splash guard processing”) with the fine screen, the other is for salsa (“lock ring processing”) with the coarse screen. 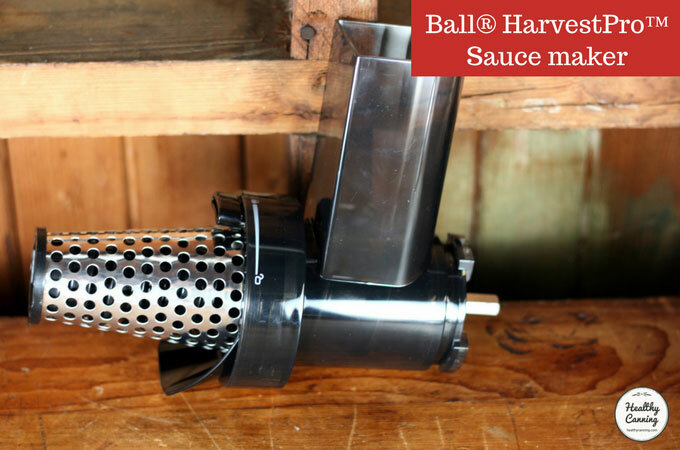 The only parts in common between the two assemblies are the auger, the chute, and the hopper. 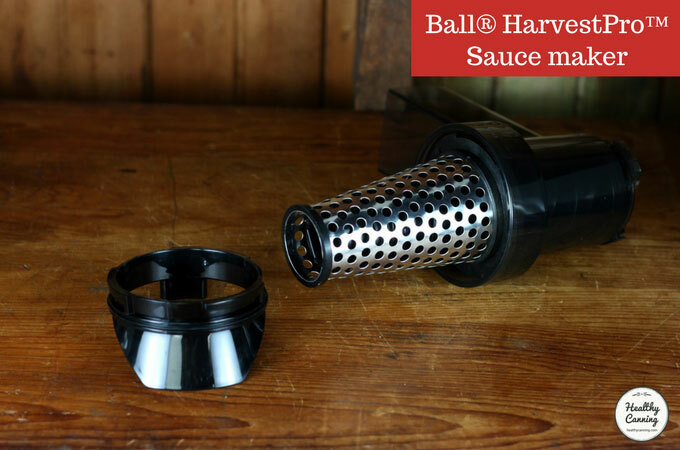 The fine screen is used for sauce making, with a plastic cover to prevent splashing and two nozzles to separate solids from liquids. 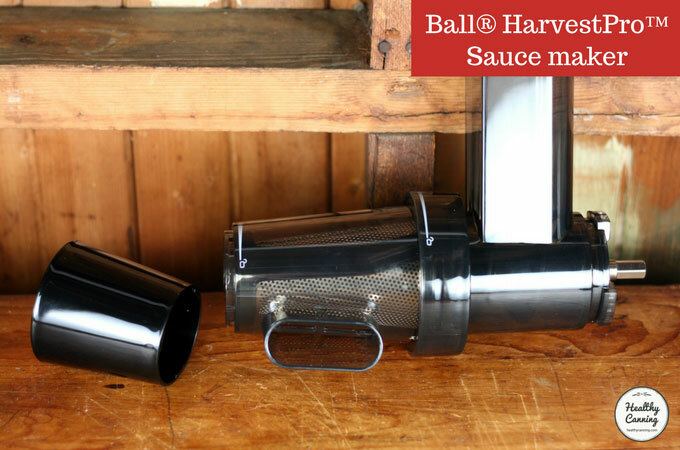 The fine screen is for sauce, though if you want a coarser, more rustic sauce or a chili sauce, the coarse screen will fit into this assembly equally as well. Once you realize the arrow on the transparent grey plastic parts is the key to things, the parts are really easy to lock together. 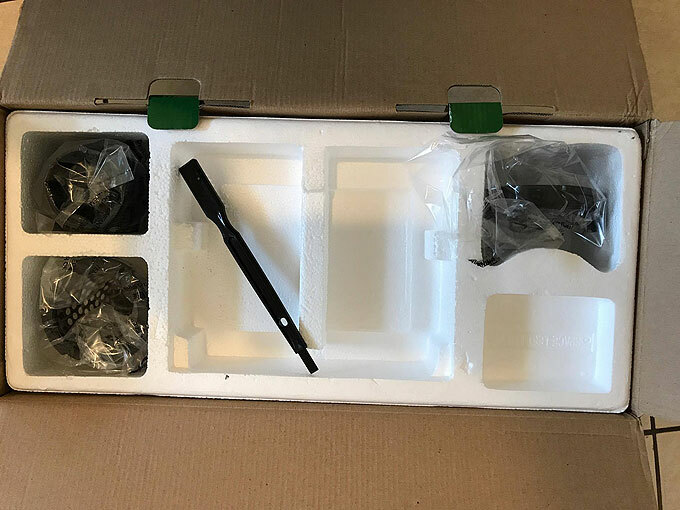 You line up the parts so that that big grey arrow lines up with the picture of the opened lock, and then simply twist the part so that the arrow moves to line up with the locked lock. 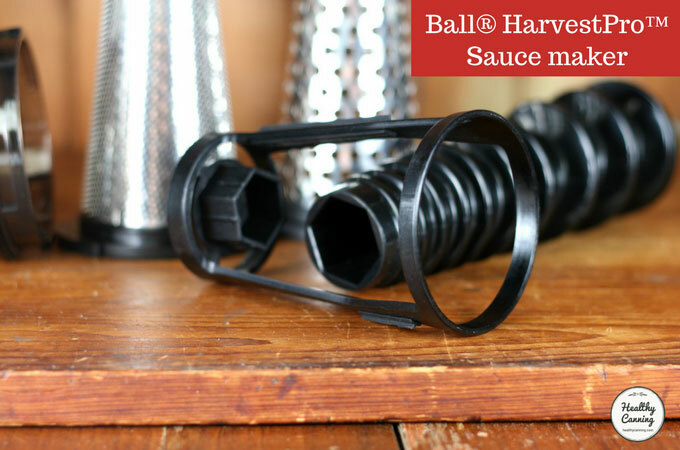 The front black nozzle locks in on the same way: twist to match an arrow up with the locks. 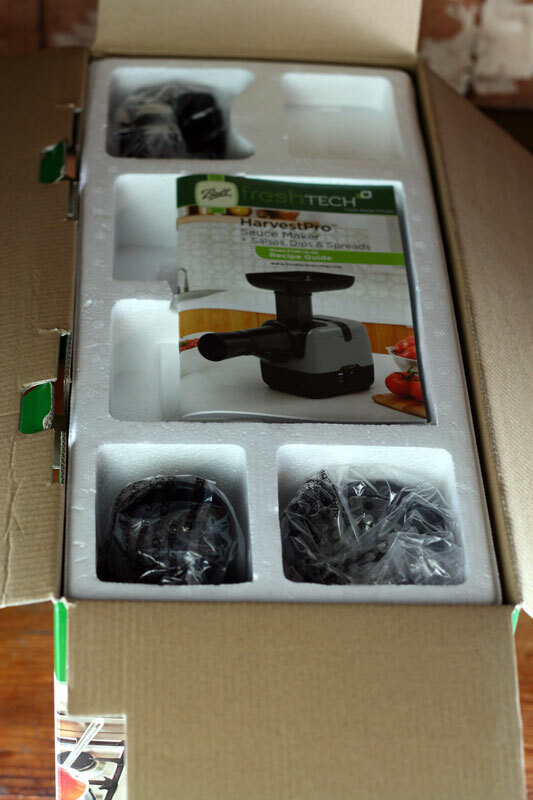 Attach to the machine. Notice in the middle top of the machine the black lock button has been pressed down into place. 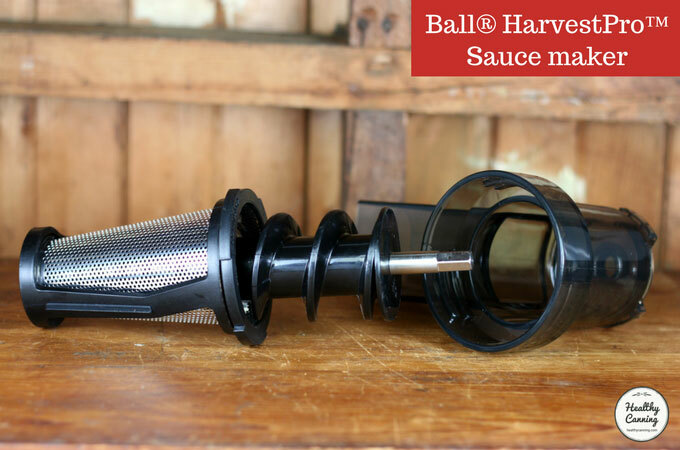 The coarse screen is used for salsa, with no cover over the screen, and no separation of solids and liquids. 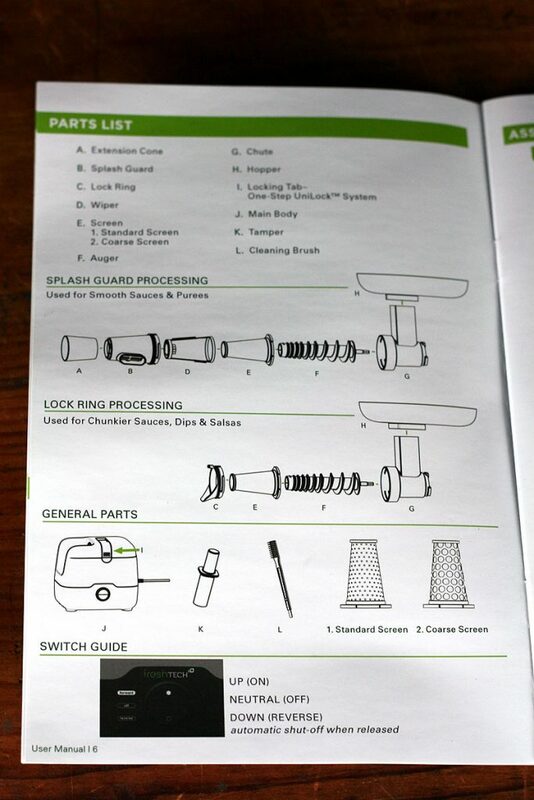 Pull the black lock down after you have inserted the spindle. Don’t try to force the lock. If you have to force it, stop: you haven’t seated the spindle properly. Try seating it again. The assembly is seated fully. The lock can now be pulled down to lock the assembly in place. 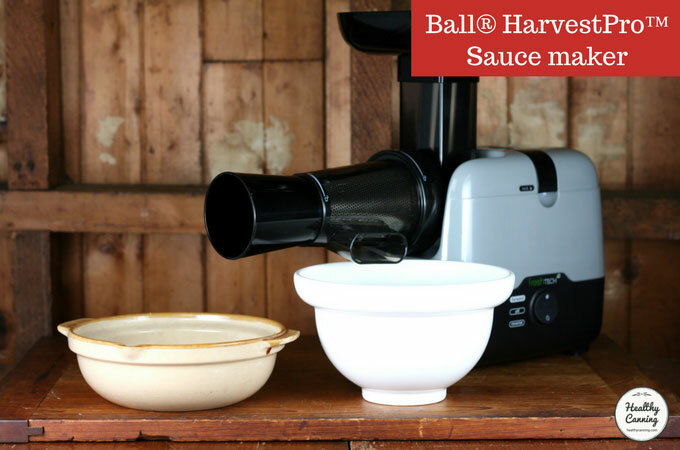 Ball recommends storing the sauce maker in the original box (Sauce maker manual, page 9, #9). 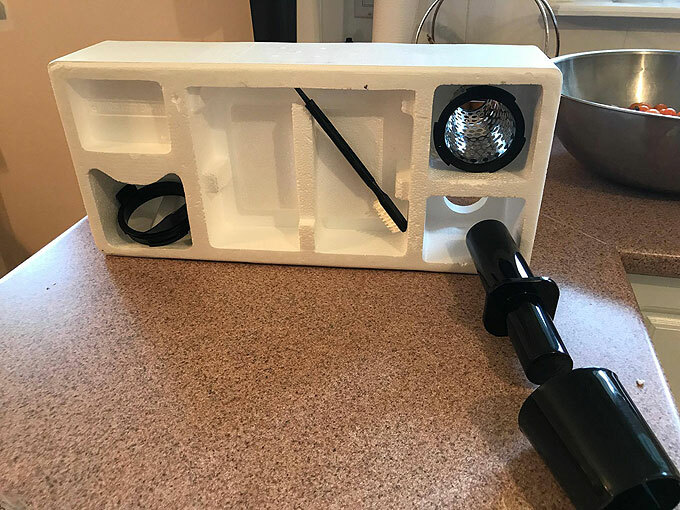 If you are going to do this, as you unpack it, you may wish to take photos with your phone, etc, of where the parts where stored, so that you’ll have those photos for future reference. 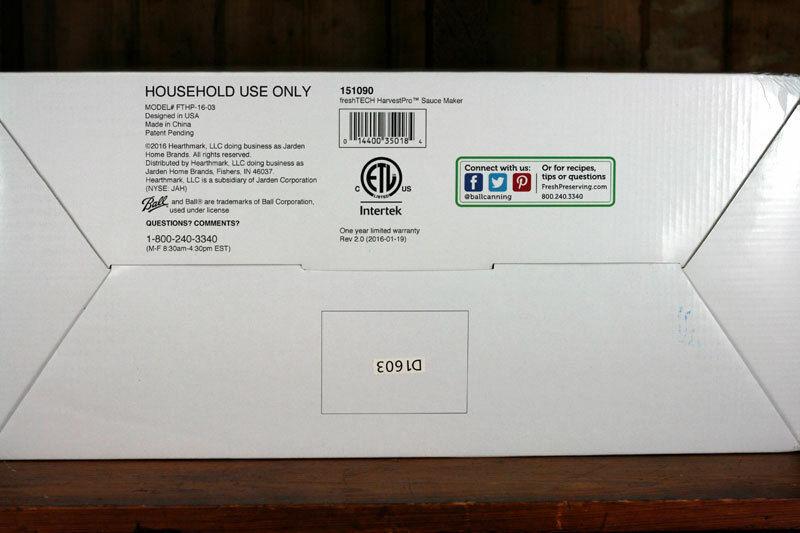 External shipping box. 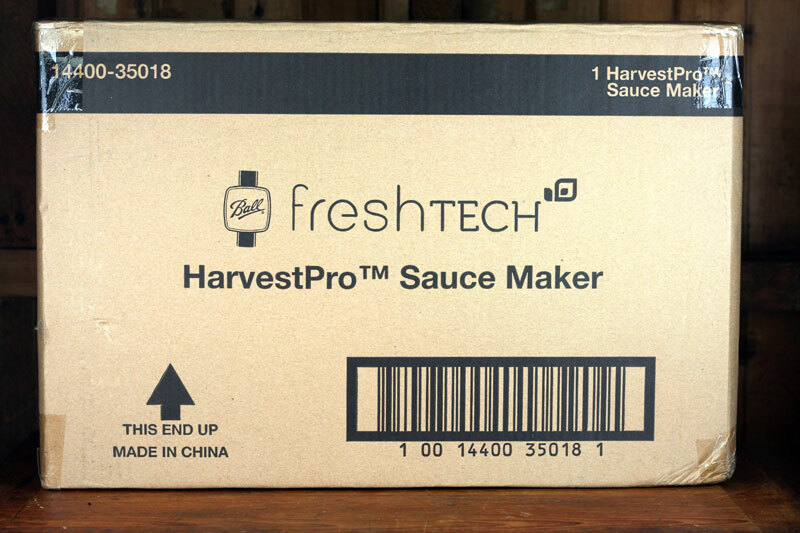 It give the weight and dimensions of the HarvestPro Sauce Maker package as shipped. 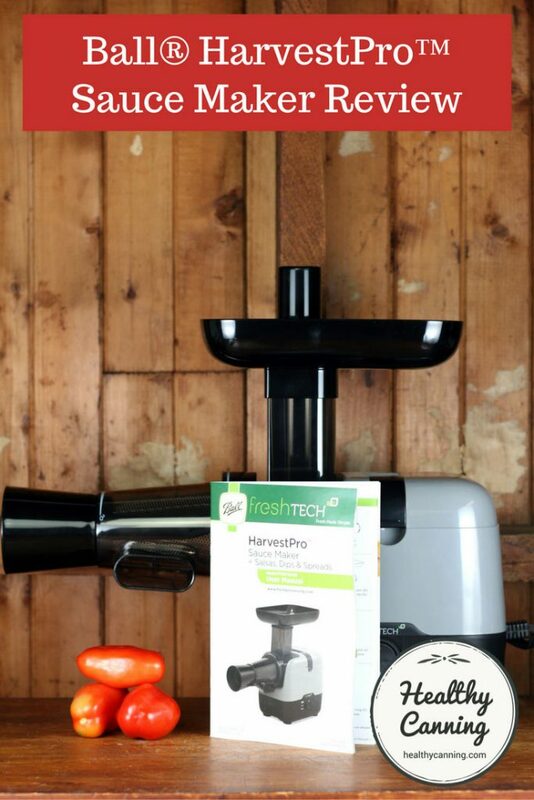 For those who want to keep the HarvestPro in its original box in order to keep all the pieces together, fitting them all back in can present a real jigsaw puzzle and be an exercise in frustration. 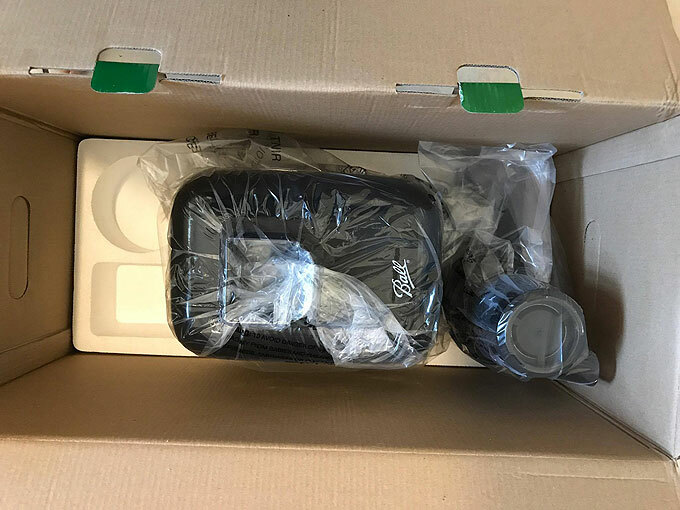 Thanks to Lyle Cameron for taking these photos while unboxing a brand new one, to record what parts go where. 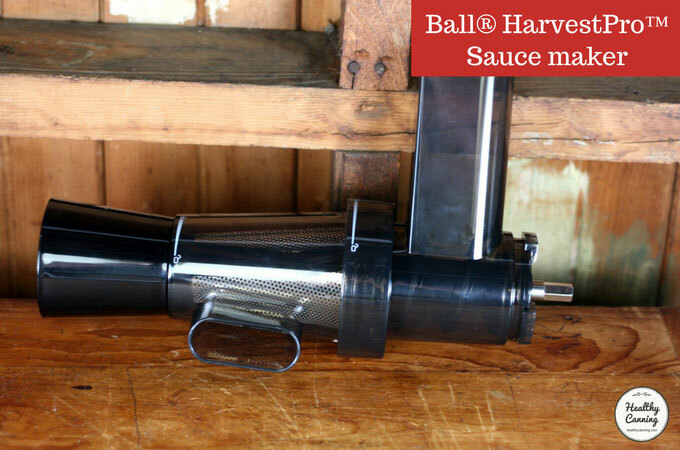 On the site, Ball lists a full slew of replacement parts for every piece of this machine on its website. But, you can no longer actually order them there! Instead, they direct you to Walmart’s site. We found some of the parts (though not all!) 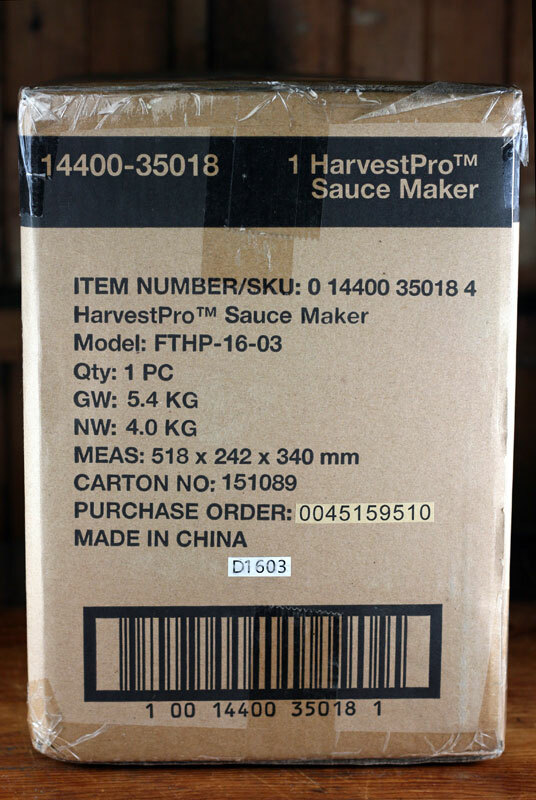 by searching for “harvestpro”: harvestpro parts on Walmart. 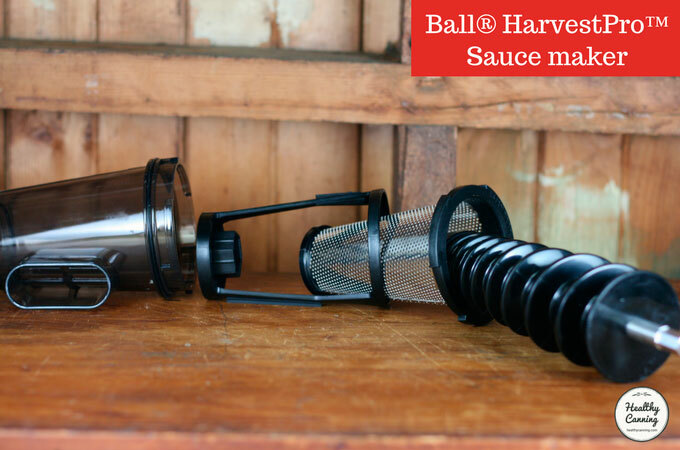 Ball no longer sells any product direct, as of 2018. You can buy this at Walmart online, or on Amazon. 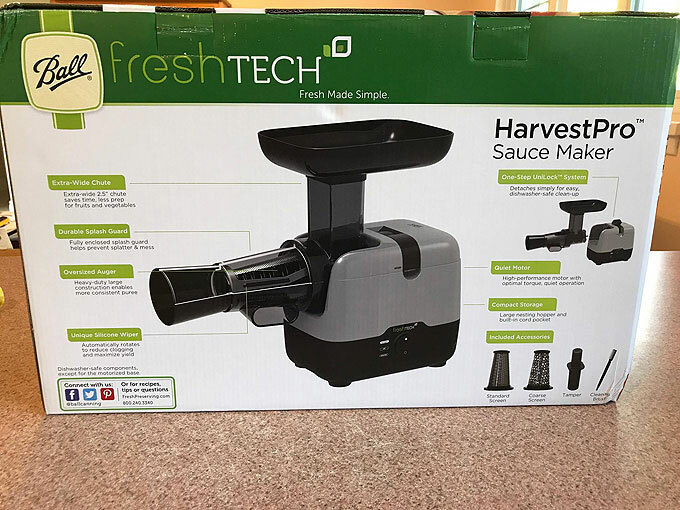 Many other stores are also selling the machine. 1. 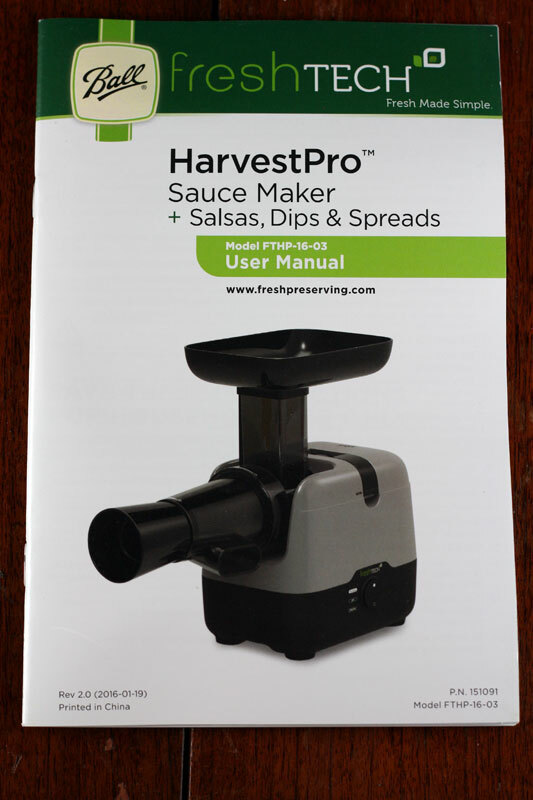 ↑ Sauce Maker book, 2016. Page 3. 2. ↑ Mary Jo at Ball. Email on file, 26 September 2016.